With 70% of its sewage water recycled, Israel leads the world in water reuse, and is advancing with desalination of sea water as well. In recent years, Israel - the world's leader in water recycling - has advanced by leaps and bounds in desalination and recycling water. Israel recycles 70% of its waste water and sewage, and in distant second place is Spain, with a mere 12%. In addition to its major natural water resources, the Kinneret and the mountain and coastal aquifers, Israel already has several desalination plants in operation, and several more planned. Together they are projected to eventually provide for two-thirds of the country's water needs. A new plant in Hadera was dedicated last week, which is projected to supply 10% of the country's water. The plant's cost is 1.5 billion shekels. It was inaugurated in a ceremony attended by President Shimon Peres, who raised a glass of desalinated water to toast the occasion. The Hadera plant uses reverse osmosis technology, which means the sea water does not have to be heated, as is done in larger plants in the world that are less environmentally friendly. The entire process of desalinating the water takes 35 minutes from the time it enters pipelines in the sea. 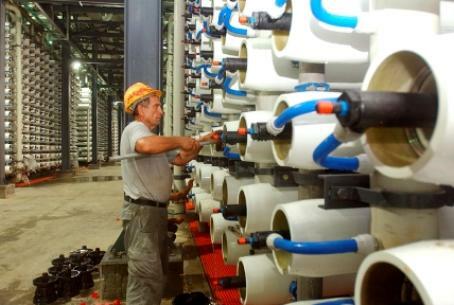 Israel's first large desalination plant (the largest of its kind in the world) was founded in Ashkelon with an investment of over 1 billion shekels, led by IDE Technologies in cooperation with Israel Chemicals and the Delek Group. The Ashkelon plant began work in 2005, and provides about 115 million cubic meters per year of desalinated water at good quality and low cost. A desalinization facility at Palmahim began work in 2007, providing 45 million cubic meters of water annually. Another desalination facility, totaling 150 million cubic meters per year, is planned to be located near the mouth of Nahal Sorek. Israel also has several sewage treatment plants. After the water is treated, it can be used for agricultural purposes, or returned to natural water sources. The treatment is multi-staged: first the larger particles and bodies are removed from the water. The second stage involves organic treatment to rid the water of microorganisms and disease. Finally, phosphorus and nitrogen are removed, allowing the water to be returned to the system. There are major sewage treatment institutes in Karmiel and Ashdod.